It’s hard to believe that 2011 is almost over. It’s been a long year and I have many reasons to be thankful. While the list of accomplishments may be small, 2011 turned out to be much better than recent years past. I rang in the new year with a new job, and for most people, it should have been a blessing. It was, but I was still harboring feelings for lost years, disappointments and the needless waste of sacrifices I had made. For those of you who haven’t followed me very long, my life literally imploded in 2010 and I was left practically in ruins. I had the absolute worse birthday in all my years, my self confidence was shattered, and I felt like everything I had worked for was for naught. I did have a inkling that things were not going well in my life long before last year, and I slowly began to make plans. But alas, they were not put in place fast enough. I guess I was hoping against hope as they say. I waited too long, or so I thought. I didn’t want it anymore. I wanted me…me to be happy, me to do what I wanted, me to fulfill my dreams and not someone else’s. So I set my sights on doing that. I changed directions on Facebook, I did some research, joined a few writing groups and started networking. So what have I accomplished…I am writing, not only for myself, but the day job has figured out how good I am as well! I have met some wonderful new people in the writing community. I am contributing to two online publications. I have picked up an editing job and I am doing book reviews. I am so grateful and feel wonderfully blessed! Things are definitely looking up indeed! Oh yeah…one more thing…my husband is a lot happier too! Wishing all of you a moment of reflection on all of your wonderful accomplishments in 2011! I’ve written this post for the 12 Days of Christmas Challenge, sponsored by the Casa De Hansen. 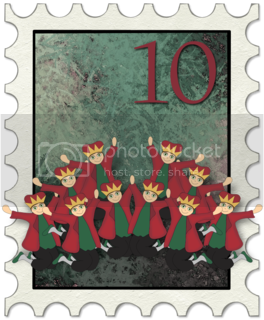 Today’s topic is 2011 Accomplishments based on the 10th Day of Christmas: “Ten Lords a-Leaping”.